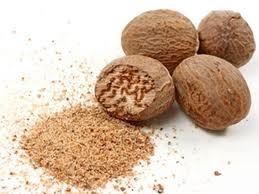 Nutmeg (Myristica fragrans) is a genus of evergreen trees indigenous to tropical southeast Asia and Australasia. Nutmeg is the actual seed of the tree, roughly egg-shaped and about 20 mm to 30 mm (1 inch) long and 15 mm to 18 mm (¾ inch) wide, and weighing between 5 g and 10 g (¼ ounce and ½ ounce) dried, while mace is the dried "lacy" reddish covering or arillus of the seed. This is the only tropical fruit that is the source of two different spices. Several other commercial products are also produced from the trees, including essential oils, extractedoleoresins, and nutmeg butter. Use in Potpourri and bath soaks, especially around the the holiday season.